Tonight I will be talking about the aurora on Bryan Crump’s radio show (Nights, Radio New Zealand National, 8.42pm, Thursday August 26th). I won’t spend much time here explaining the underlying physics of the effect, but take a look at the beautiful infographic posted by Peter Griffin. Now although I didn’t see any sign of the predicted aurora a few weeks ago (did anyone with clear skies that night see anything? ), I did regularly encounter aurora during the early years of my PhD studies at the University of Alberta in Edmonton, Canada. In fact, I managed to take a girl out to see an absolutely spectacular display on our first date. ’Ah, physics …’ I said, as we stared up at the blue, red and green streaks shimmering in the sky. Not the greatest line ever used but good enough that the girl in question married me a few years later. Now you might guess that my apparent good planning was down to some quick back of the envelope calculation. Not so — although theoretical physicists have many powers (and lets face it, they have special need of them when romance is called for), predicting the time and place for watching aurora is not yet one of them. Both the northern and the southern aurora are caused by electrons and protons (known as a plasma) from the sun colliding with nitrogen and oxygen in the Earth’s upper atmosphere. This flow of plasma from the sun, known as ’space weather’, is concentrated by the Earth’s magnetic field at the poles so that you are more likely to see an aurora in Edmonton or Dunedin than Wellington. Like terrestrial weather, space weather can be quite irregular, which is why aurora can be relatively special events. As the plasma coming from the sun consists of charged protons and electrons, its flow from is strongly affected by the magnetic activity of the sun. At periods of high solar magnetic activity, it turns out that the sun is more likely to be eject plasma. 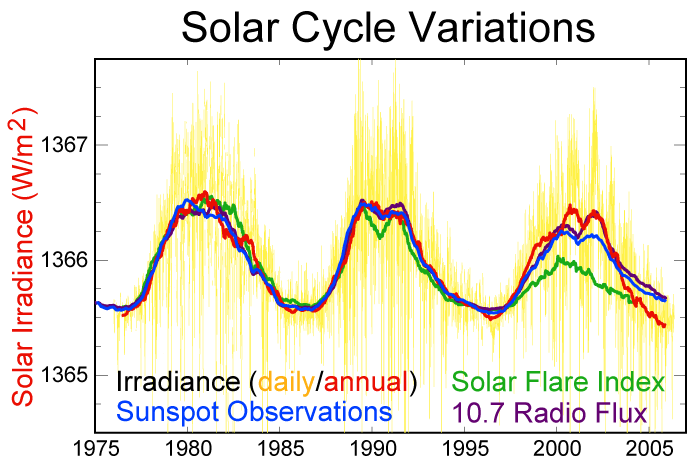 Solar magnetic activity cycles over a period of just under 11 years for reasons that are not yet well understood. We are entering a period of maximum solar activity now, so the flow of plasma from the sun should be relatively strong. Yet if I look at when I took my date out to see the aurora (May 1994), the sun was actually in a period of minimum activity. And since 2009, the sun has been in an active period, yet we are only just starting to see aurora at our latitudes now. Picking a good night for an aurora is obviously not so straightforward. So what’s the problem? Well, the flow of a plasma is a complicated thing: a flowing plasma generates a magnetic field, but the flow itself depends on the magnetic field. So to understand a plasma you need to work out both the magnetic field and the flow at the same time: it’s the physicists’ version of the chicken and the egg problem. In fact, doing this is so difficult that it gets its own sub-field of physics known as magnetohydrodynamics, or MHD for short. The equations that are used to model MHD are nonlinear and difficult to solve, requiring large supercomputers for even simple flows. In the case of the aurora, part of the difficulty seems to lie in the way in which the magnetic field of the sun, the Earth and the plasma itself interact to direct the plasma towards the atmosphere. Now knowing when plasma from the solar wind is going to hit the atmosphere is not just important for the love lives of physicists. Intense flows of plasma can cause geomagnetic storms, which can knock out power grids and satellites. For this reason NASA launched the THEMIS space mission a few years ago to put in place a collection of satellites that can monitor the space weather. Data from this mission will be used to help improve the models we use for the flow of plasma from the sun and may even allow scientists to forecast the solar weather in the way terrestrial weather is forecast today.